As companies increasingly embrace digital methods of conducting business, questions around which corporate information is most sensitive and how can security be achieved without sacrificing productivity become more important. Steps must be taken to understand the data being used and shared within the organization, and processes must be put in place to mitigate the risk of inappropriate data disclosure or data loss. TITUS Classification Suite provides tools to assist with this task. 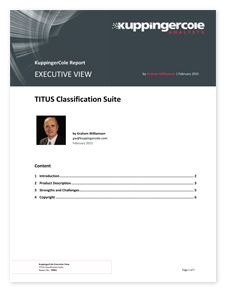 In this Executive View report, learn what European-based analyst firm KuppingerCole sees as the strengths of TITUS Classification Suite for organizations looking to effectively protect their most sensitive information.